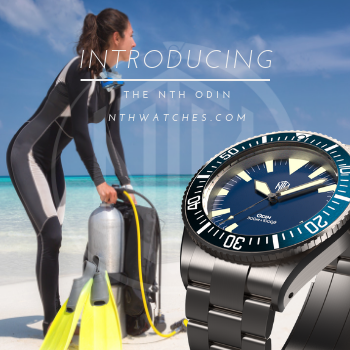 I Shortly after he launched his first watch, the Helmsman, Zelos founder Elshan Tang told me about his plans for future models, including a diver's watch. He was going big on this one. Not in terms of size (although 43mm is hardly small), but in concept. 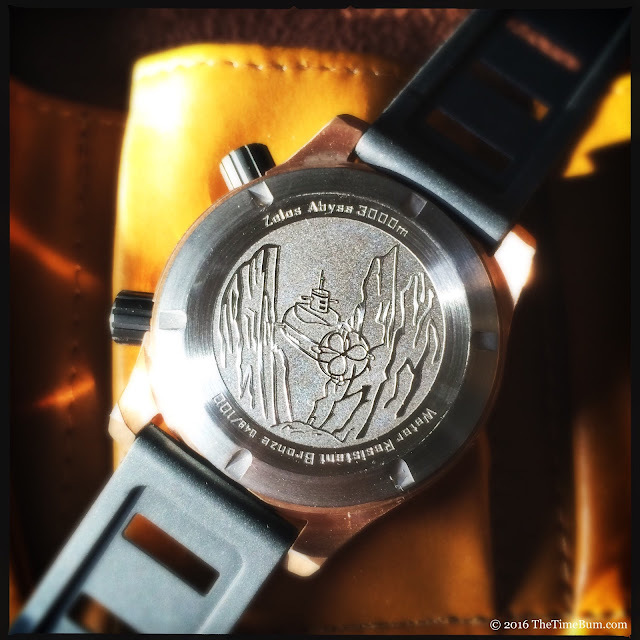 The new one would be a dual-crown, bronze case diver, with a depth rating measured in thousands of meters, and it would look unmistakably Zelos. He made good on his vision. He launched the Abyss on Kickstarter at the end of 2014, and easily crushed his funding goals. 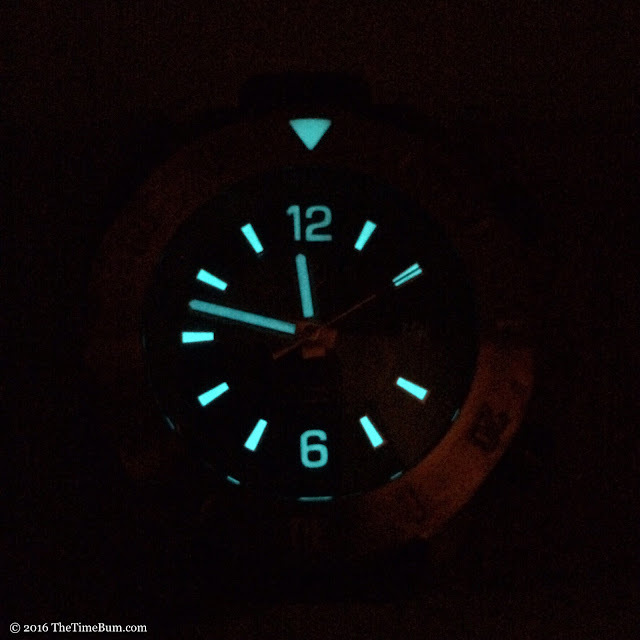 Five variants were offered: blue, green, brown, black, and black with a black DLC bezel. Production models started shipping in the autumn of 2015, and some models are still available for sale now. Elshan sent me a green one for this review. I was delighted from the moment I opened the package. Maybe I'm weird, but big, glossy display boxes with felt lining do little for me. They are fun for a moment at the initial unboxing, but then they go right to the bottom of the closet. I'm much happier when a watch arrives in something I can actually use. Zelos excels in this area. The watch ships in a simple wooden box with a snap latch lid. It's not fancy, but it a box I might use for something else – a NATO collection perhaps. 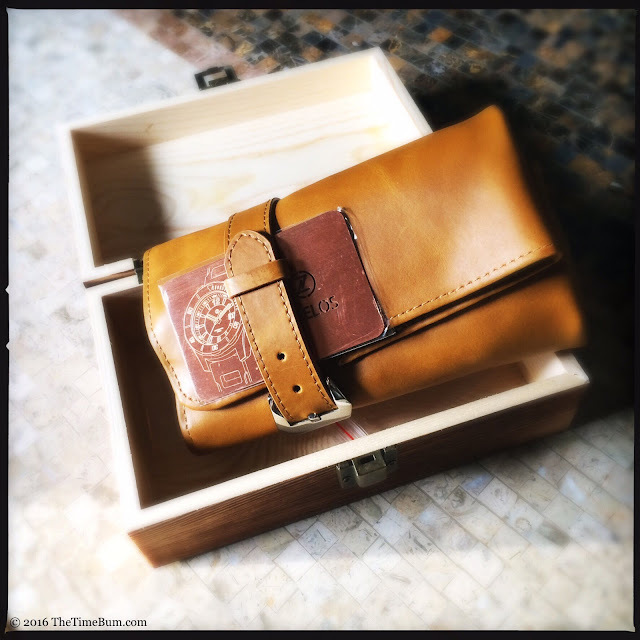 Inside is a five-pocket leather watch roll containing the Abyss, two extra straps, and a quality strap changing tool. I would have happily purchased the travel roll on its own. 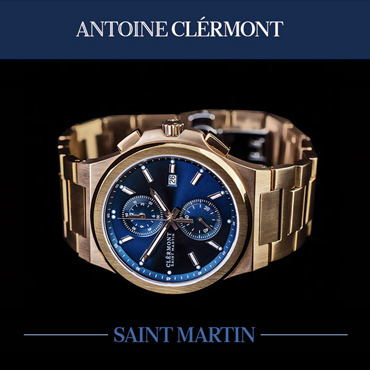 It is a lovely yellow-tan leather that fastens with a buckled strap. 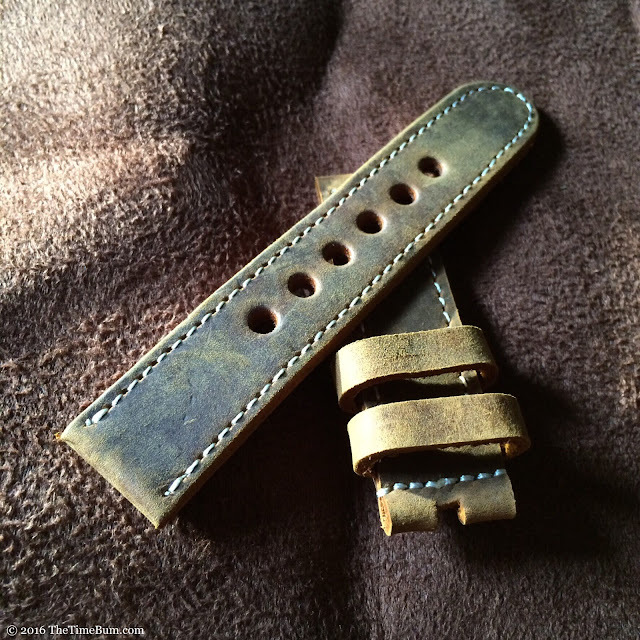 It safely secures the watch for shipping, and should serve well for years after. The Zelos Abyss is a mighty chunk of metal - CuSn8 bronze to be precise. Measuring 43mm across and just under 52mm long, it will fit within the confines of most wrists, but it is also a whopping 18mm thick. It will not sit meekly under a shirt cuff, nor should it. With a 3000m depth rating and helium release valve, it would be a shame not to take it to the briny depths. Of course, having no interest in diving myself, I took it for a walk on the beach instead. What can I say? I'm a romantic. A lazy, land-dwelling romantic. No matter, the watch is perfectly functional on dry land too. The dual crowns operate smoothly. The top rotating the inner bezel while the bottom sets the movement. Each has five gaskets to ensure a watertight seal. Both crowns are signed, and DLC coated, but while the black finish coordinates well with the black dial and black bezel models, perhaps less so for the color dials. It is not that the crowns are unattractive, but I would have preferred they match the case. On the other hand, they do allow you to wear the watch on straps with black hardware, which can be handy. Unlike the Helmsman, the case is simple, without dramatic cut-outs or scallops, only a polished, beveled edge along the upper surface. Similarly, the 120-click, unidirectional bezel has a flat, brushed surface with recessed markers and a lume-filled triangle at top center and a poised edge on its cog-shaped grips. It works. The flat brushed surfaces emphasize the watch's mass while the hints of polish lighten the design, providing a welcome bit of flash on the otherwise sober expanse of bronze. 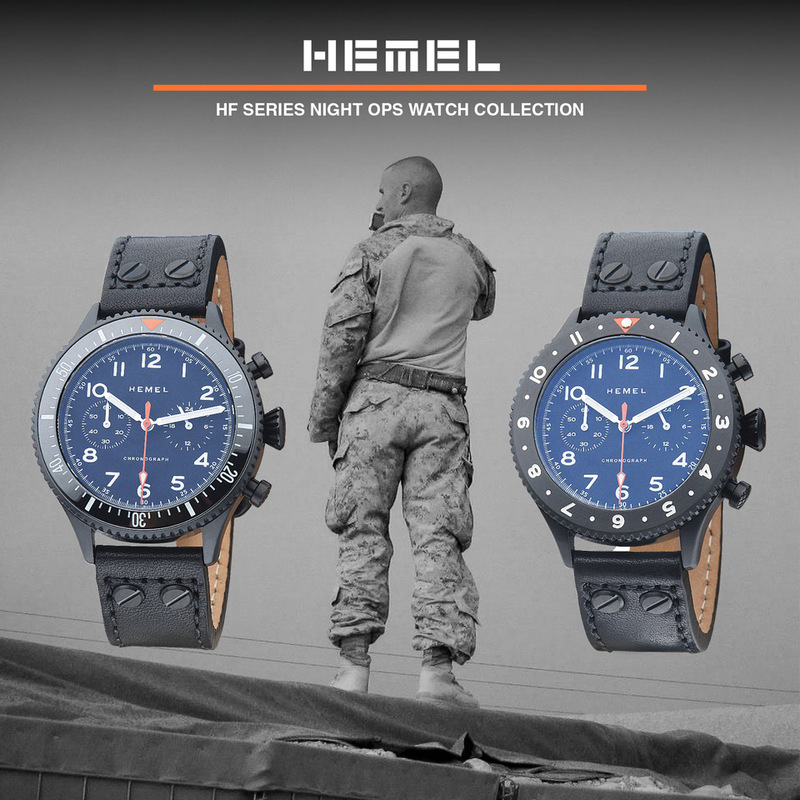 Flip it over, and you are treated to a solid case back with a submarine decoration, basic information, and your watch's production number. The cover is a hefty 4mm thick and screws down to seal two O-rings. Out front is a 7mm domed sapphire crystal with an inner anti-reflective coating. 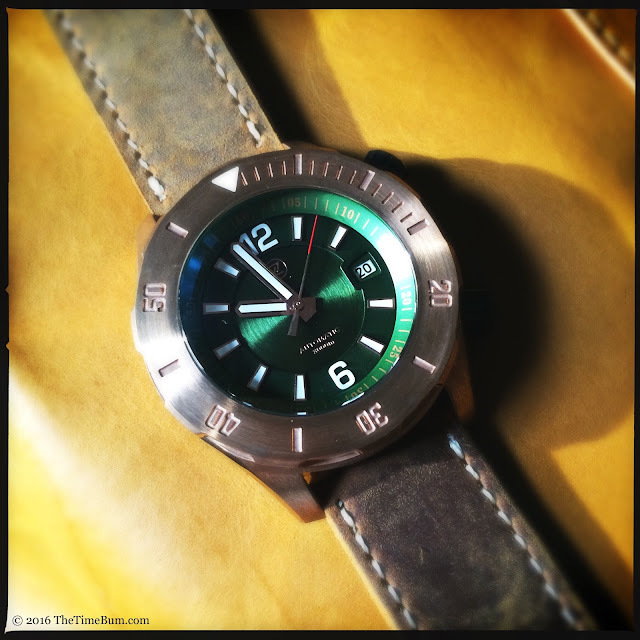 This vault protects a tried and true Miyota 9015 automatic movement. Aficionados already know the specs: 24 jewels, 28.8k bph, 40+ hour power reserve, hacking and hand winding capabilities, and rock steady reliability. The case is nicely finished, with no unduly sharp corner or rough edges. Being that bronze is a "living" metal, the surface is ever changing as it reacts to its environment. It arrived at my door almost perfectly clean and reddish gold with just a few dark spots of oxidation on the bezel. In short order, a mellow patina began to form, settling first in the brush marks on its surface and creating a sober, mottled effect. You could always polish this off, but that defeats the purpose of buying bronze in the first place. 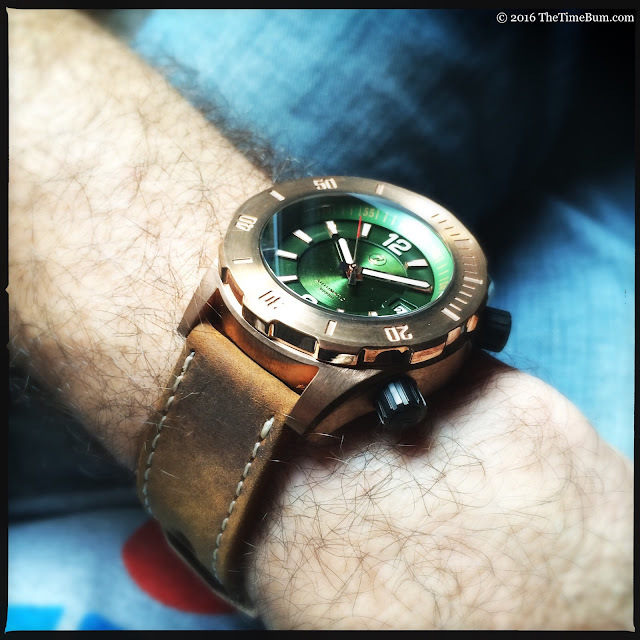 I think the worn look is right at home on a tool watch. Where the case is almost all business, the dial is far more playful. 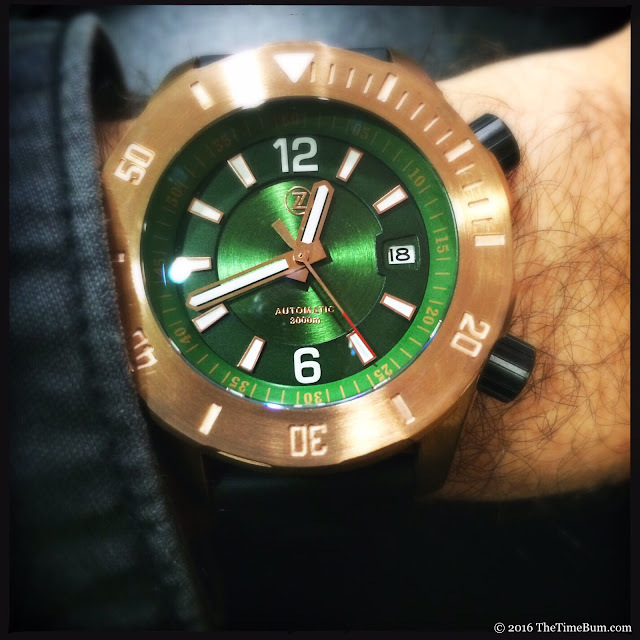 The shimmering jade green color catches you first then draws you into the three layers inside: first the internal bezel with its printed gold index, then a flat layer of applied gold markers, and finally the lower surface bearing the gold Zelos logo and "Automatic 3000M" printed proudly below. Broad, gold hands carry fat bands of bright BWG9 SuperLuminova from tip to tail, leaving the sides semi-skeletonized. The second hand is also gold but painted red a good 1/3 of its length from the tip. It is a beautiful dial that does not want for function. The markers and hands are highly legible, day and night. The combination of internal and external timing bezels may be overkill, but they do allow for some interesting fine tuning and damn if they don't look cool. 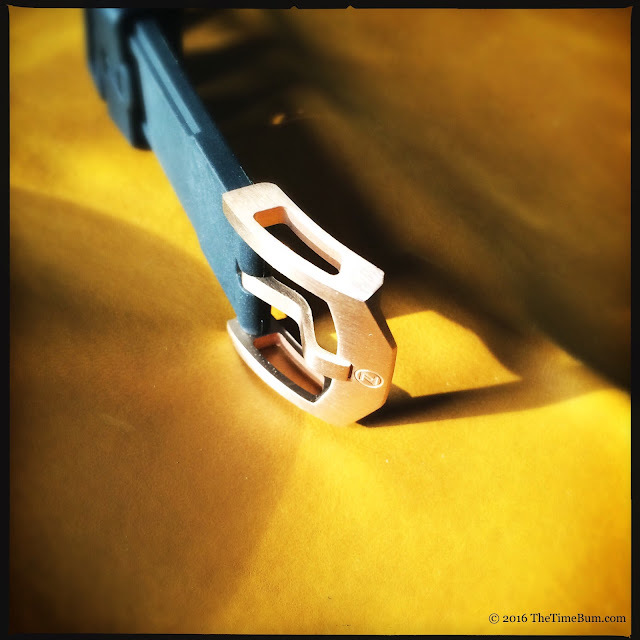 The three 24mm straps offer three very different experiences for the wearer. 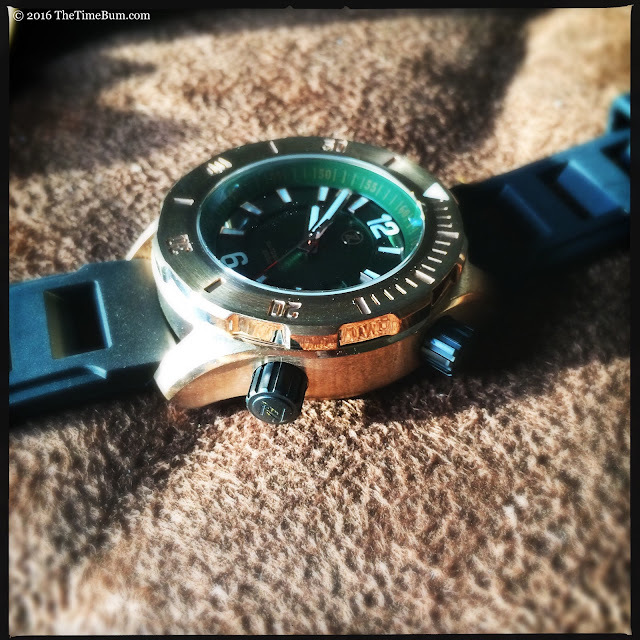 The black nylon NATO with its bronze loops is a sensible choice for diving, but I found it made the already top-heavy Abyss a bit unwieldy, making it my least favorite. The black rubber dive strap offers much better balance and also coordinates with the black crowns. This would be my pick for any wet activities. The final strap is a brown, oil-tanned leather which displays a fine pull-up effect. Like the bronze, the leather will proudly carry the marks of age and wear, developing a rugged character. To my eye, this is the best of the bunch: comfortable, attractive, and thick enough to handle that massive case. Both of the two piece straps share a signed bronze buckle. Like that of the Helmsman, the Abyss buckle is highly stylized with open sides and a unique shape, but it is let down by sharp edges and corners. I didn't find it uncomfortable, but the lack of finish, when compared to the case, was nonetheless disappointing. Still, this is about the only thing I can criticize. In every other respect, the Zelos delivers – perhaps even over delivers. The Abyss sells for $820 direct from Zelos. 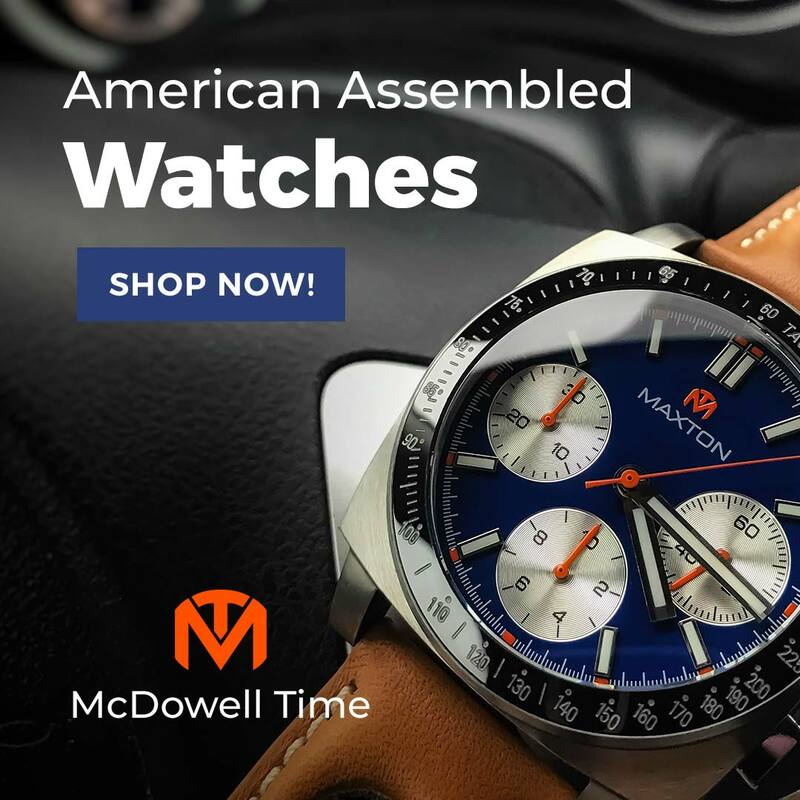 It is a fair sum to part with, but you are getting an attractive, capable watch with several tasty accessories to boot. Only the green, brown, and black-on-black are available, which is good news because I always thought the green was the prettiest of the bunch. 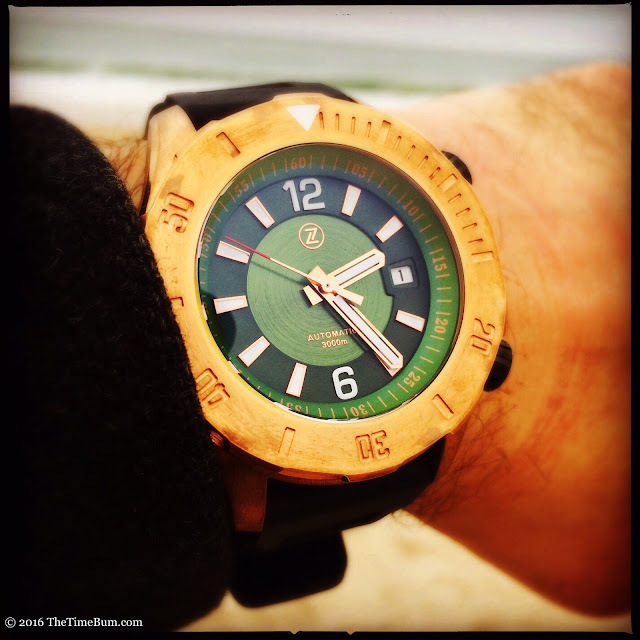 Quantities are limited, so head over to ZelosWatches.com and check out one for yourself. Pro: Insane depth rating, burly case. Sum: A lovely watch with remarkable specs and some well-considered extras. The Time Bum approves.